Huaxiang Huang and Ryland Thomas. The financial crisis of 1847 has often been dubbed “The trial of the Bank Charter Act of 1844 (Morgan (1952)). 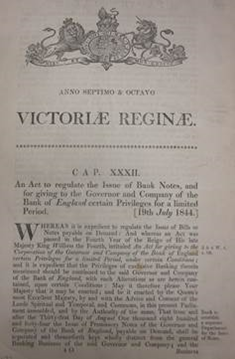 The Act sought to remedy the errors of crises past by trying to prevent the overissue of banknotes that many had felt was the major cause of previous crises in 1825 and 1837. The Act gave the Bank of England an effective monopoly in the issue of new bank notes and those additional notes had to be backed one for one with gold. But this had a crucial unintended consequence: it made it difficult for the Bank to act as a lender of last resort. When the crisis struck, the limits imposed by the Act effectively had to be suspended. So how did things to get this point a mere three years after the Act’s introduction? 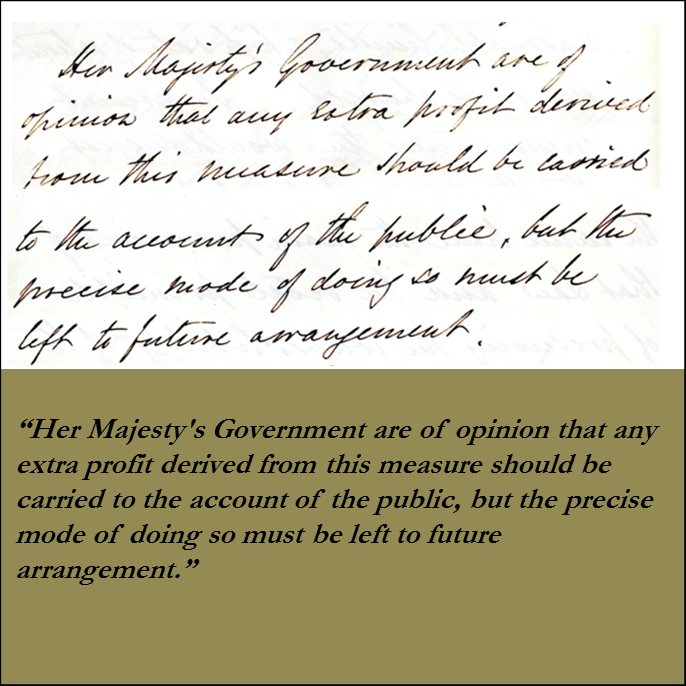 The 1844 Act split the Bank into two departments, an accounting convention that exists to this day (see Bank of England Annual Report 2016). The Issue Department of the Bank was to look after the note issue and the issuance of new notes was tied to the amount of gold it held in reserve. There was a fixed limit of £14mn on the number of notes that could be backed by securities known as the fiduciary issue. The idea was that if gold flowed out of the country due to an overheating economy and a balance of payments deficit, the stock of notes in circulation would automatically decline as people cashed in their notes for gold to pay for imports. It was also envisaged that the Bank would respond to this by raising interest rates and reducing its lending to protect its reserves and attract more gold from abroad. The combination of higher interest rates and a falling money supply would lead to lower activity and prices which would improve the balance of payments and provide an automatic stabilisation mechanism. The rest of the Bank – the Banking Department – was envisaged by the Act to operate like any other private bank. It could lend to the private sector on normal commercial terms (largely via discounting bills of exchange or advances secured on high quality collateral) and provide deposit accounts for its customers. Importantly, the Banking Department was to back up its liabilities with its own reserve holdings of Bank of England notes in a similar way to other commercial banks. These arrangements, although well-intentioned, had several (largely) unforeseen consequences each of which were to play a part in the build up to the 1847 crisis and how it unfolded. First, the Bank directors took the freedom offered by the split of departments to use the Banking Department balance sheet to compete more aggressively with the growing commercial banking system and discount market. The Bank at this stage was still privately owned and needed to make a return for its shareholders. In the two years following the passing of the Act, the Banking Department’s holdings of private securities expanded markedly following a cut in Bank Rate (the rate at which it would lend to the market) from 4% to 2.5%. Second, because the Bank Charter Act imposed a gold-related limit on the total stock of Bank of England notes (ie those in circulation plus those held in reserve in the Banking department), the lending activity of the Banking Department could (consciously or unconsciously) end up offsetting or “sterilising” the automatic stabilisers built into the rules for the Issue Department. For example, if there was an outflow of gold, the Banking Department could offset the impact on notes in circulation and the money supply by lending more of its reserve notes to the private sector or creating additional deposits for the borrowers (many of them banks) in their accounts held with the Banking Department – the modern day equivalent to reserve accounts. Third, the split of departments meant it was the reserve of notes in the Banking Department that would be the first line of defence in the event of a financial crisis. A crisis would typically involve a large rise in the demand for Bank of England notes (the ‘safe’ asset) by the financial system which would be obtained by bringing bills of exchange into the Banking Department for discount. That would lead to more notes in circulation at the expense of a lower reserve of notes in Banking Department. As a result the Banking Department’s reserve of notes could run dry even if there was sufficient gold in the Issue Department to back the note issue as a whole. That could then induce an even bigger scramble for liquidity given the Bank Charter Act prohibited the Bank from printing any additional unbacked notes. The crisis of 1847 occurred in two phases (see Campbell in Dimsdale and Hotson (2014)). The first phase, which peaked in April 1847, did not lead to a full blown crisis but was a harbinger of things to come. The economy was in a weak position at the start of the year. The Bank’s aggressive discount policy had helped to fuel a boom in railway shares between 1845 and 1846 that was now beginning to unwind. Bad harvests had also put upward pressure on corn prices and imports which put pressure on gold reserves. The Bank however was slow to react to this and insulated the impact by continuing to lend at rates lower than those in the market. However by April the Bank’s reserve of notes had fallen dangerously low and both the Bank and the public woke up to the implications. The Bank reacted strongly by raising Bank Rate, cutting back its lending to the market and selling government bonds. The sudden change in policy led to a temporary panic, but was partially cured when higher rates led to inflows of gold. Letter from the Prime Minister and Chancellor of the Exchequer to the Governor and Deputy Governor of the Bank of England, 25th October 1847. Source: Bank of England Archive G6/350. What is interesting about the letter is that the Government specified conditions for suspending the Act, which was to recur in subsequent letters: the Bank should not obtain any long-term profit as a result of these actions. The Bank paid no interest on its note or deposit liabilities and expanding its discounts of what were largely high quality bills at an elevated rate of interest would improve its profitability. 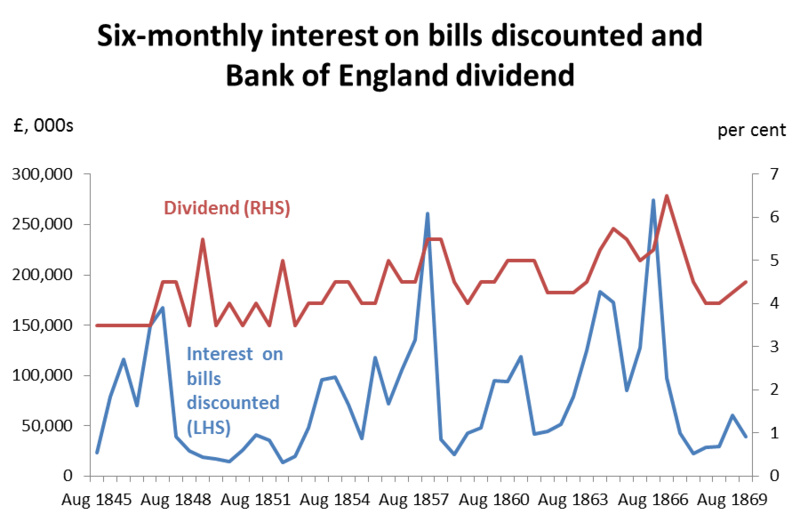 Chart 1 shows the interest income of the Bank increased markedly during each of the 1847, 1857 and 1866 crises. There is no evidence that any of these profits were ever transferred back to the Government or that they were more than offset by losses on bills brought in during the crisis. And dividends to shareholders typically increased after each crisis. The suspension of the Act acted almost immediately to end the crisis to such an extent that the Bank did not need to actually breach the legal limit on the note issue. As a result suspension of the Bank Charter Act became a regular feature of the authorities’ response to future crises (see the posts on 1857 and 1866). Indeed the mere anticipation of suspension was probably enough to dampen the impact of other incipient liquidity crises – for example in the crises of 1878 and 1890 there was little pressure on the Bank’s note reserve. In addition the Bank no longer tried to compete aggressively for lending business. Overall, the financial crisis of 1847 certainly evoked memories of crises past, suggesting that the Bank had not yet fully learned the lessons of how both to prevent and deal with such crises. But it also provided a vision of what was yet to come, the gradual acceptance of its role as lender of last resort for the financial system during the second half of the C19th. Huaxiang Huang and Ryland Thomas work in the Bank’s Monetary Assessment and Strategy Division.